The new Snorkel 3019E electric slab scissor lift. The company, which is celebrating ‘60 years of innovation', is unveiling a number of new product launches at the tri-annual construction equipment show which attracts in excess of 500,000 visitors. Originally shown as a concept at CONEXPO-CON/AGG 2017, the Snorkel S3019E makes its global debut as a pre-production unit at Bauma, and is anticipated to be in full production by Q4 2019, with orders for CE and ANSI units being accepted at the show. This 5.79-m (19-foot) slab scissor lift features a patent-pending design for its scissor stack which stows completely inside the chassis. This enables a low step-in height, as well as a low stowed height, meaning that it does not require folding handrails to pass through doorways. Equipped with electric drive and electric steering, and capable of lifting up to 250kg (550 pounds), the S3019E delivers long duty cycles, and shares many features with the Snorkel line of hydraulic slab scissor lifts. Showcasing another electric-powered innovation, Snorkel is displaying a preview of a lithium-ion powered electric Speed Level lift. Branded the Snorkel SL26E, this lithium-ion battery powered unit will deliver excellent four-wheel drive performance and 50 percent gradeability, just like its diesel-powered equivalent, the Snorkel SL26SL, as well as automatic self-levelling on slopes without the need for outriggers. Bauma will also mark the official launch, outside of North America, for two new telehandlers. Joining the Snorkel SR626, the new Snorkel SR1442 and SR1745 expand the new Snorkel rough-terrain telehandler line to three models. The new telehandlers are branded as the SR9244 and SR1045 respectively in The Americas. Equipped as standard with four-wheel drive and enclosed cabs with heat and air conditioning, the new SR1442 is capable of lifting up to 4,200kg (9,260 pounds) and has a maximum lift height of up to 13.5 m (44 feet 4 in. ), and a maximum forward reach of up to 9.5m (31 ft. 2 inches). The larger SR1745 has a maximum lift height of up to 16.4 m (53 feet 9 inches), and maximum forward reach of 12.6 m (41 feet 4 inches), and can lift up to 4,535 kg (10,000 pounds). For the first time, Snorkel will exhibit CE compliant versions of their new mid-size telescopic boom lifts, the 14 m (46 feet) Snorkel 460SJ and the 20.1 m (66 feet) Snorkel 660SJ, which are now both available to order with European Stage V engines. Snorkel is expanding production of these units, with the 660SJ now being produced in Snorkel's U.K. manufacturing facility, in addition to existing assembly in both U.S. facilities in Henderson, Nevada and Elwood, Kansas. The Snorkel 460SJ will also be added to the U.K. assembly facility in the coming months. At Bauma, Snorkel is displaying CE compliant TM12E and TM16E models, marking their official launch outside of North America. With platform heights of 3.65 m (12 feet) and 4.87 m (16 feet) respectively, the TM12E and TM16E self-propelled telescopic mast lifts feature a zero inside turning radius, and smooth and efficient electric drive for a long duty cycle. Production of the electric drive Snorkel TM12E and TM16E has expanded from its original location in Henderson, Nevada, with both models now also being assembled in Snorkel's U.K. facility. The first CE compliant Snorkel S3215L will also be shown at Bauma. The Snorkel S3215L was introduced to the North American market in 2018, as a lightweight yet robust electric slab scissor lift, designed for use in areas with low floor loadings. Delivering a platform height of up to 4.6 m (15 feet), the S3215L has a lift capacity of 305 kg (670 pounds), yet weighs just 952 kg (2,100 pounds) with a floor loading at max. capacity of just 951.9kg/m2 (195 psf.). 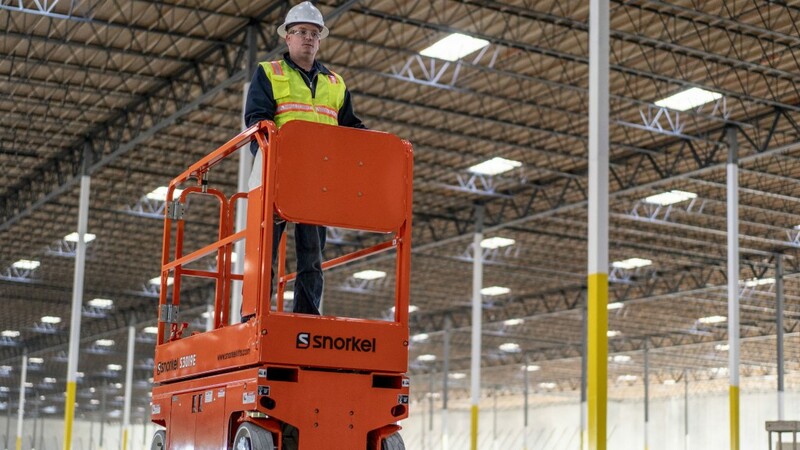 Produced in Henderson, Nevada, the Snorkel S3215L is now available to order globally, and shares many features with the Snorkel electric slab scissor lift family, that will also be on display. On Snorkel's 790 sqm (8,500 square-foot) stand in the outdoor area, 28 Snorkel lifts will be on display, which in addition to the new product launches, will include many popular lifts, including the recently upgraded Snorkel A38E electric boom lift; Snorkel S3970BE and S2755RT compact rough terrain scissor lifts; Snorkel A46JE, A46JRT and A62JRT articulated boom lifts; the UL40 push-around mast lift; and low-level lifts, including the Snorkel S3010P and S3010E mini scissor lifts. Founded in 1959 by Art Moore, Snorkel has roots in the firefighting industry, before entering the early AWP market with a number of innovative boom lifts, which helped to define the market as it is today. Celebrating this heritage, the Snorkel stand at Bauma 2019 will feature historical imagery displays and timelines, as well as being the venue for customer events daily. As part of the 60th anniversary celebrations, Snorkel will showcase its range of material lifts with the giveaway of a Snorkel ML24C construction-duty material lift at the show. The Snorkel ML24C weighs just 162 kg (358 pounds) yet can lift loads up to 295 kg (650 pounds) at a load centre of 0.36 m (14 inches) to heights of up to 7.4 m (24 feet 4 inches). Visitors to the Snorkel stand are invited to enter their business card into the prize draw for a chance to win the ML24C, which will be drawn at 7.00pm at the Snorkel stand on Friday, 12th April 2019. Find Snorkel at Stand FS.1002/3 in the outdoor area at Bauma 2019.